According to the 2016 PA budget, the PA currently pays 26,800 families of "Martyrs" a total of 660 million shekels ($183 million) per year, and 6,500 terrorist prisoners receive PA salaries amounting to 486 million shekels ($135 million) per year. "Regarding the salaries (rawatib) of the Martyrs and prisoners, Dr. Muhaisen emphasized that this is not a financial matter, but rather a matter that is connected to the Palestinian historical narrative, according to which the prisoners and Martyrs represent our Palestinian people's struggle. He praised the position of [PA] President Mahmoud Abbas, who responded to the American administration: 'Even if I will have to leave my position, I will not compromise on the salary of a Martyr or a prisoner, as I am the president of the entire Palestinian people, including the prisoners, the Martyrs, the injured, the expelled, and the uprooted.'" Abbas' statement irrevocably repudiates the impression of US Secretary of State Tillerson earlier this month that the PA "intends" to cease the payments to families of terrorist "Martyrs" who "have committed murder or violence against others." Palestinian Media Watch has documented that no such intention exists. Since Abbas' meetings with US President Trump earlier this year, and Tillerson's statement, Palestinian leaders have repeatedly stressed that the terrorist salaries will not be stopped. "On behalf of [PA] President Mahmoud Abbas and our Palestinian people, I salute all of the Martyrs' (Shahids') families... I emphasize to them that their rights are protected, and we will continue our diligent work with the relevant PLO institutions to fulfill our basic, humanitarian, and national obligations towards them... We remember the sacrifices and struggle of the pure Martyrs, guardians of the land and identity who have turned our people's cause into a historical epic of struggle and resolve." PMW reported that according to some Palestinian sources, the PA may be planning to hide the payments to terrorists, disguising them as "social aid' to the families, as a way of seemingly complying with the demands of the US and other donor countries while at the same time continuing to pay the salaries. "In a speech that he gave on behalf of the Palestinian leadership, [Fatah Central Committee member and Fatah Commissioner for Arab and China Relations Abbas] Zaki emphasized that the prisoners' issue is one of the top priorities of the Palestinian leadership, and that the leadership will not submit to the American and Israeli pressures in any attempt to harm the salaries (rawatib) of the families of the Martyrs (Shahids) and prisoners." "PLO Executive Committee member Ahmed Majdalani emphasized that the issue of the prisoners' salaries (rawatib) is not up for negotiations, and it is unacceptable to turn it into a precondition for a political process, as it is a political, national, and moral issue." "PLO Executive Committee member Dr. Ahmed Majdalani said...: 'At this event and on this blessed day, and among those who are more precious than all of us, the children of the Martyrs (Shahids) and prisoners, we emphasize before them - on the instructions of [PA] President [Mahmoud Abbas] - that we will always help and assist the members of our people and we will stand by them at all times. The talk taking place here and there about stopping the allowances (mukhassasat) of the prisoners and Martyrs is not true at all.'" "Fatah Movement Central Committee member, [Fatah] Commissioner of Mobilization and Organization [in the West Bank, and PLO Central Council member] Dr. Jamal Muhaisen said... that Hamas is indeed a political rival, but it is part of the fabric of the Palestinian people, and we will not agree to any Palestinian organization being placed on the terror list. He also demanded that the Arab regimes place the Israeli occupation and the settlers on the terror list. Regarding the salaries (rawatib) of the Martyrs (Shahids) and prisoners, Dr. Muhaisen emphasized that this is not a financial matter, but rather a matter that is connected to the Palestinian historical narrative, according to which the prisoners and Martyrs represent our Palestinian people's struggle. He praised the position of [PA] President Mahmoud Abbas, who responded to the American administration: 'Even if I will have to leave my position, I will not compromise on the salary of a Martyr or a prisoner, as I am the president of the entire Palestinian people, including the prisoners, the Martyrs, the injured, the expelled, and the uprooted.'" Hamdallah added: 'With great pride I again meet with the family members of the Martyrs of Palestine under the auspices of the National Association of the Martyrs' Families of Palestine, the framework that unites the Martyrs' families wherever they are, the main protector of their affairs and rights. Together with you we remember the sacrifices and struggle of the pure Martyrs, guardians of the land and identity who have turned our people's cause into a historical epic of struggle and resolve.'" Dr. Ahmed Majdalani said in a speech that he gave: 'At this event and on this blessed day, and among those who are more precious than all of us, the children of the Martyrs (Shahids) and prisoners, we emphasize before them - on the instructions of [PA] President [Mahmoud Abbas] - that we will always help and assist the members of our people and we will stand by them at all times. The talk taking place here and there about stopping the allowances (mukhassasat) of the prisoners and Martyrs is not true at all.'" 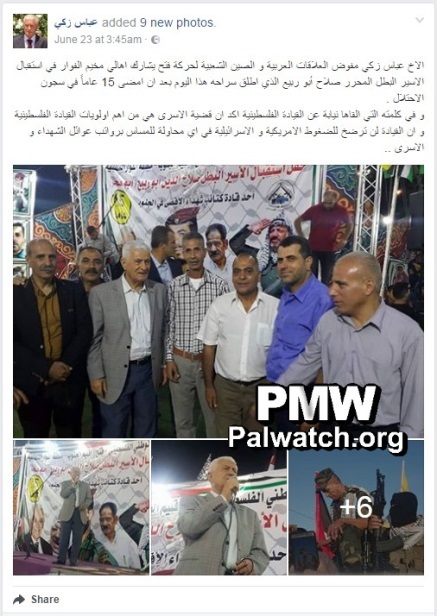 Posted text: "[Fatah Central Committee member and] Fatah Movement Commissioner for Arab and China Relations Abbas Zaki participated together with residents of the Al-Fawwar refugee camp [southwest of Hebron] in a reception for released prisoner Saleh Abu Rabi' who was released today [June 23, 2017] after 15 years in the occupation's prisons. In a speech that he gave on behalf of the Palestinian leadership, Zaki emphasized that the prisoners' issue is one of the top priorities of the Palestinian leadership, and that the leadership will not submit to the American and Israeli pressures in any attempt to harm the salaries (rawatib) of the families of the Martyrs (Shahids) and prisoners." The pictures show Abbas Zaki on stage at the event, with a large sign in the background. One of the leaders of the Al-Aqsa Martyrs' Brigades in the southern [West Bank]"
Saleh Al-Din Abu Rabi' - an official of Fatah's military wing, the Al-Aqsa Martyrs' Brigades. He was released in June 2017 after 15 years' imprisonment in Israel. PMW has been unable to verify the circumstances of his crime and imprisonment. Headline: "Majdalani: The issue of the prisoners' salaries is not up for discussion"
Ahmed Majdalani noted that [Israeli] occupation Prime Minister Benjamin Netanyahu is trying to raise secondary issues and flood the American side with requests and preconditions before entering any political process, and this is in order to prevent the American administration from implementing the decisions of the international bodies. Majdalani emphasized that the issue of the prisoners' salaries (rawatib) is not up for negotiations, and it is unacceptable to turn it into a precondition for a political process, as it is a political, national, and moral issue." 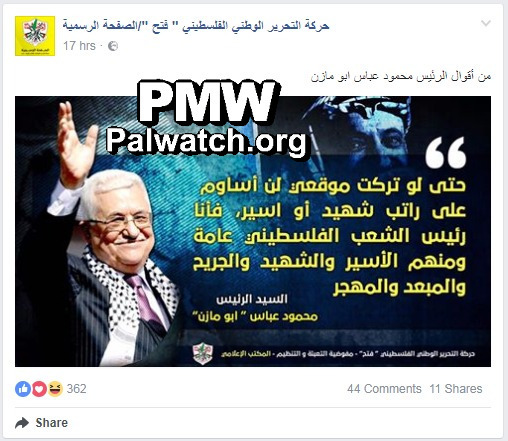 Posted text: "From the words of [PA] President Mahmoud Abbas"
Text at bottom of image: "Information Office of the Fatah Movement Mobilization and Organization Commission"
The image also includes a picture of Yasser Arafat in the background and the Fatah logo at the bottom, which includes a grenade, crossed rifles, and the PA map of "Palestine" that presents all of Israel as "Palestine" together with the PA areas.